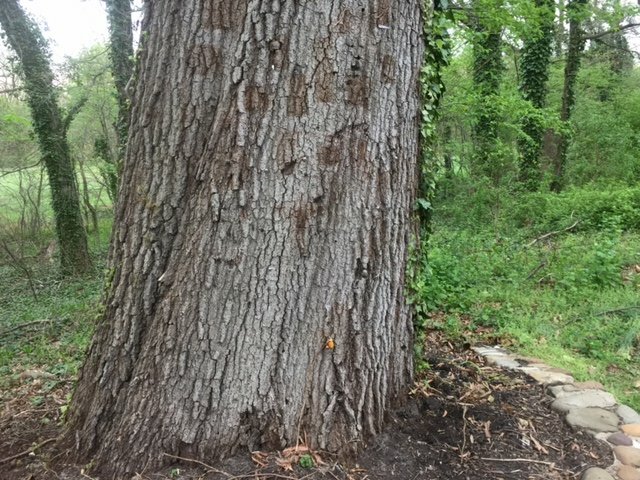 A memorial surrounds a large tulip poplar tree near where the body of toddler Brendan Creato was found in Cooper River Park in Haddon Township in October 2015. Most of the memorial items had been removed by April 17 in preparation for a possible visit by the jury hearing the David "DJ" Creato's murder trial. 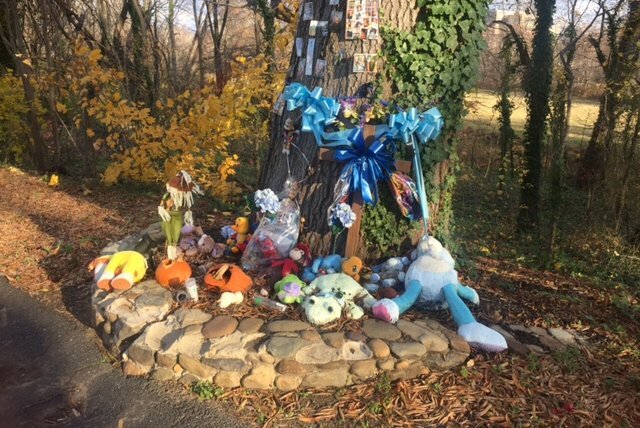 The scene near where tot Brendan Creato's lifeless body was discovered Oct. 13, 2015, was cleared of most – but not all – memorial reminders over the weekend, perhaps facilitating a visit by the jury that will hear his father's murder trial. But the actual scene where the toddler's body was recovered, a large rock in a stream deeper into Cooper River Park, still has memorials in place, seemingly overlooked. A huge tree that had fallen across one of two paths leading to the creek had also been removed. A South Jersey Superior Court judge tentatively ruled last week that the jury hearing the murder case against the 3-year-old boy's father, David "DJ" Creato, could visit the scene if "logistics" were addressed. Access to the scene was one of those logistical issues, with the tree blocking the most direct path to where the child' body was found on that fall Tuesday morning. Creato was charged with his son's murder and child endangerment in January 2016 and has remained jailed since. The other issue was the potentially prejudicial assortment of memorials to the child. Most, on and around a large tree situated on the border of the park, were removed Saturday, as was the fallen tree. But Camden County workers left in place, as of Monday morning, another smaller display of memorials near where a police dog found Brendan Creato's body. A memorial to tot Brendan Creato was cleared from Cooper River Park in the Westmont section of South Jersey's Haddon Township over the weekend. His father, David “DJ” Creato goes on trial this week, accused of murdering his son. A judge has tentatively agreed to allow the jury to see where Brendan's body was found by a police dog. A bench and memorial plaque honoring the child are also visible nearby. Jury selection in the high-profile case is set for Tuesday morning at the Camden County courthouse. That task is expected to run to at least Wednesday, meaning opening arguments could begin Thursday morning. It is unclear when the jury might visit the scene if the judge ultimately approves the visit, which would include a drive past the apartment, about a half a mile away, that Brendan shared with his father. 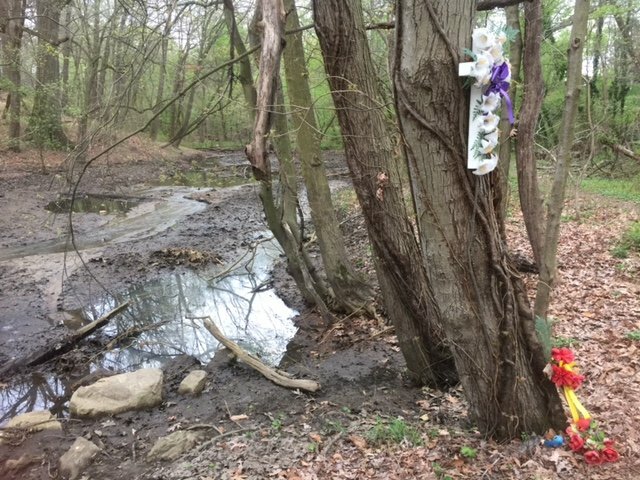 Clean-up crews did not remove some of the memoriams to Brendan Creato near the rock in the creek where the boy's body was discovered on the morning of Oct. 13, 2015. Water levels in the creek vary considerably and the rock where the boy's body was found is usually surrounded by water. The child was found in pajamas and clean white socks, his arms and legs submerged in the creek, stomach down on the rock, head to one side, his hair on that side damp. The county medical examiner, after three autopsies were performed, concluded in December 2015 that the death was a homicide, but the exact cause was listed as "unknown."